Rada: Wi-Fi at the hotel. print outs? Smartphones also provide an easy way for teachers to “inspire students to positively contribute to and responsibly participate in the digital world,” as espoused by the ISTE Standards for Educators. research shows that when students are engaged in their learning — and they’re almost always engaged with their phones when given a choice — they are less likely to succumb to distractions. Videos can express any type of learning in any style, from music videos to interviews, book trailers, historical re-enactments, tutorials and stop animations. 2. Access an online dictionary and thesaurus. Find synonyms in many languages at Open Thesaurus! 3. Collaborate and share with Padlet and Twitter. 5. Listen to podcasts and read the news. 6. Use the apps, obviously. Before creating a BYOD policy, take a look at existing HR and legal procedures. Many email, VPN, and remote access security policies can be applied to mobile devices, as well. BYOD isn’t limited to smartphones. According to Gartner, a “new norm” is emerging in which employees manage up to four or five devices at work. A smart BYOD policy doesn’t mean IT is off the hook. Rather, successful policies rely on IT and employees sharing security obligations. Employees often fail to realize that all data on their devices is discoverable, regardless of whether the device is personal or company-owned. The question of who owns what is still a legal gray area, though companies increasingly take the liberty to remote wipe employees’ personal devices once they leave their job. Avoid the guessing game with a clear exit strategy. In April, a PLAYlive Nation lounge in Tracy, Calif., hosted its first Fortnite tournament and sold out. Hundreds of players bought tickets to play against one another and win prizes. Joost van Dreunen, the CEO of Superdata Research, a video game analytics firm, says most shooter games are serious and simulate violence. Fortnite, he says, is more like a friendly game of tag. His company estimates the game has made about $223 million across all platforms in March alone. In lifetime sales, it had made about $614 million. The game is free to play, but Epic Games, the company that owns Fortnite, makes money through microtransactions. Players can spend real money to make cosmetic changes to their characters in the game. They can buy things like skins, which are like costumes, for their characters or emotes, which are celebratory dance moves their characters can do after winning or killing another player in the game. Ninja, the gamer name taken by 26-year-old Tyler Blevins, is now a legend in the Fortnite world. He is a master at the game and rocketed into popularity after playing in an online battle with rap artists Drake and Travis Scott on March 14. That battle has been watched more than 9 million times. Many educators want to ban the game from their classrooms, but some are taking the opposite approach, attempting to weave students’ interest in Fortnite into class discussions and assignments. Nick Fisher, a science teacher at Fort Zumwalt North High School in O’Fallon, Mo., said his students like to take screenshots of gameplay and send them to friends over Snapchat. Teenagers want to broadcast their victories, and because the game is on their phones, it’s easy to post updates to social media, making Fortnite “the perfect concoction of addiction,” said Fisher. Schools and teachers should be guiding parents when it comes to appropriate limits around screen time, said Kolb. Most parents will appreciate research-based recommendations, such as turning off all screens a set amount of time before bed, she said. Games like Fortnite can even have social benefits, said John Velez, an assistant professor of journalism and electronic media at Texas Tech University. Velez, who studies the positive effects of video games, has found that playing violent games cooperatively with helpful teammates promotes pro-social behavior. Chris Aviles, the coordinator of innovation, technology, and 21st century skills for the Fair Haven Public Schools in New Jersey, wrote “A Teacher’s Guide to Surviving Fortnite,” an exploration of ways the game can be used for instructional purposes. The guide, posted to his blog Teched Up Teacher, suggests how to integrate the game into writing prompts, math lessons on probability, and physics. Aviles doesn’t advocate playing the game at school. There isn’t any educational value in letting students engage in virtual combat during a lesson, he said. Instead, teachers can build a lesson around one aspect of the game, such as having students calculate the best angle of approach as they jump from the “Battle Bus,” the floating bus that drops players onto the map at the beginning of each match. In January, two of Apple’s shareholder groups asked the company to look at the addictive effects of iPhones on children. Google’s recent developer conference highlighted tools to help users better control smartphone usage. A 2017 study published in the journal Social Psychological and Personality Science tracked college students’ progress on their goals over the course of a semester and found that successful goal attainment was less about self-control and more about blocking and eliminating potential distractions. The best approach is to use empathy, compassion and collaboration to help the young people in your life find ways to manage their digital workflow. Encourage visualization for inspiration and motivation. The first step is getting students to buy in and to want to make behavioral changes. Focus on compartmentalization. A 2009 study from Stanford researchers found that people who juggled several streams of electronic information were not able to pay attention, remember key information or switch tasks as effectively as those who completed one task at a time. Using the Pomodoro technique of spending 25 minutes focused on one task followed by a five-minute break can be an easy way to have students begin to shift from a multitasking to a monotasking mind-set. Provide structured support as needed. A middle school student with whom I worked recently was relieved when his mother used the Mac OS app SelfControl to block YouTube and ESPN while he was doing his homework (Cold Turkey is a similar PC-based app). ECAR collaborated with 157 institutions to collect responses from 13,451 faculty respondents across 7 countries about their technology experiences. ECAR also collaborated with 124 institutions to collect responses from 43,559 undergraduate students across 10 countries about their technology experiences. Please see the 2017 student and faculty studies hub for more about this year’s research. When it comes to meeting technological support needs, students’ default modality is DIY. Students are more than twice as likely to figure out solutions to technology problems on their own, to search online sources, or to ask a friend than they are to use their campus help desk. Contacting the vendor or company to fix a technology problem is the last resort. Laptops are king, smartphones are queen, and tablets are on the way out. Students’ experiences with their instructors’ use of and approach to technology in the classroom are a mixed bag. A majority of students said most of their instructors have adequate technology skills, use technology to enhance learning, and encourage the use of collaborative technology tools. However, students said fewer faculty use technology for sophisticated learning tasks (e.g., engagement, creative and critical thinking), and relatively few faculty ask students to use their own devices for in-class work. Students are choosing sides in the online versus face-to-face debate. For the fourth year in a row, the number of students preferring a blended learning environment that includes some to mostly online components has increased. The number of students preferring completely face-to-face or completely online courses continues to dwindle. The number of students expressing no preference has been cut by more than half since 2014. Students are satisfied with features of their LMS…except when they aren’t.Students have favorable opinions about the basic features and functionalities of their LMS. But, the more sophisticated the task and the more engagement required of students, the less happy they tend to be. This may be a function of the tools, the instructors who use them, or both. 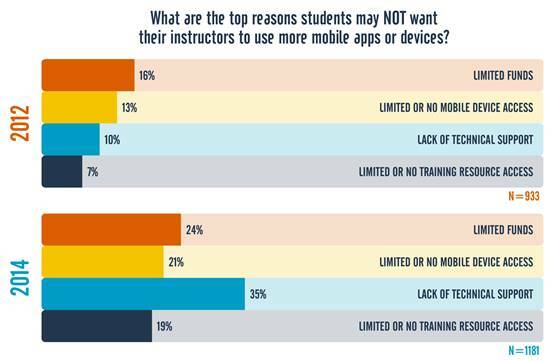 Students would like their instructors to use more technology in their classes.Technologies that provide students with something (e.g., lecture capture, early-alert systems, LMS, search tools) are more desired than those that require students to give something (e.g., social media, use of their own devices, in-class polling tools). We speculate that sound pedagogy and technology use tied to specific learning outcomes and goals may improve the desirability of the latter. Students reported that faculty are banning or discouraging the use of laptops, tablets, and (especially) smartphones more often than in previous years. Some students reported using their devices (especially their smartphones) for nonclass activities, which might explain the instructor policies they are experiencing. However, they also reported using their devices for productive classroom activities (e.g., taking notes, researching additional sources of information, and instructor-directed activities). Build a digital citizenship curriculum that includes mobile device use. What are the most popular apps and websites you use? What do you think are inappropriate ways that cell phones have been used? What is poor cell phone etiquette? Why? How can cell phones help you learn? How can cell phones distract from your learning? How do you feel about your cell phone and the activities you do on your phone? What should teachers know about your cell phone use that you worry we do not understand? Do you know how to use your cell phone to gather information, to collaborate on academic projects, to evaluate websites? How can we work together to create a positive mobile mental health? Post a red button on the classroom door: the cell phone parking lot. Establishing a Class Contract: Ask them to brainstorm consequences and write them into a class contract. Digital Bodies cofounders Emory Craig and Maya Georgieva for an interactive session that will examine five developments in virtual, augmented, and mixed reality with the greatest potential to impact teaching and learning. Ask your questions live as they explore how groundbreaking developments in VR, AR, MR, and artificial intelligence will power immersive technologies and transform learning.